The destination has become all the rage on this popular vlogger’s social media accounts after he posted seven promotional videos about the Riviera Nayarit. Together they have garnered over 152 thousand visits on YouTube; and the number of followers on the @RivieraNayarit account on Twitter increased by 35% from June through July. 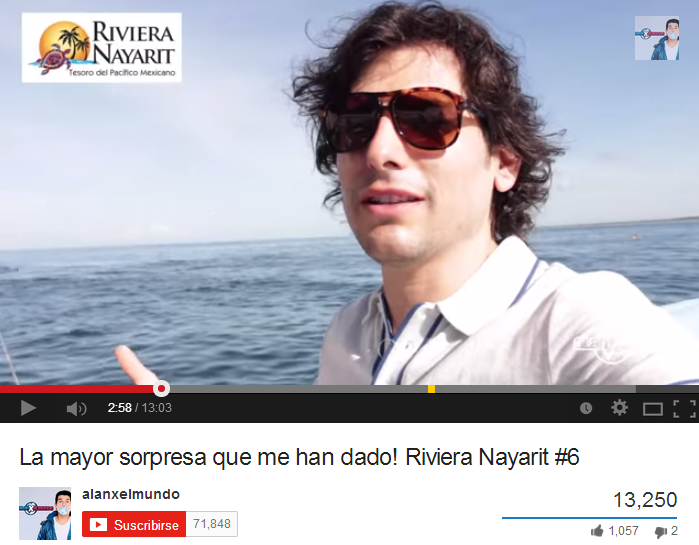 Popular vlogger AlanxelMundo finished production on the seven videos inspired by his visit to the Riviera Nayarit, which was organized by the Convention and Visitors Bureau (CVB); these posts helped to broadcast the destination across both party’s social media accounts. The videos include “Dios bendiga a Sayulita!” (“God Bless Sayulita!”); “¡Una playa única en el mundo!” (“A Unique Beach on the Planet!”), in a salute to Hidden Beach; “¡Una mujer ejemplar!” (“An Exemplary Woman!”), in honor of Nicole Swedlow; “Rincón de Guayabitos”; “Una fruta que sabe a siete frutas” (“A Fruit That Tastes Like Seven Others”), referring to the yaca; “¡La mayor sorpresa que me han dado!” (“The Biggest Surprise Ever!”), about the Island of Mexcaltitán; plus the extra “Clases de cocina con Betty Vázquez” (“Cooking with Betty Vázquez”). Together these videos have had over 152 thousand views on YouTube, where Alanxelmundo has over 71,800 subscribers. The audiovisual productions as well as other marketing activities resulted in an increase of 35% in Twitter followers on the @RivieraNayarit account. A few days after the launch of the videos there were already 38 mentions of @RivieraNayarit on the @AlanxelMundo Twitter account, where he has more than 28,200 followers. The @RivieraNayarit account was the most mentioned, and the #RivieraNayarit hashtag was among the top ten used. The videos showed over 100 views on the destination’s Twitter account, which helped increase the click count by 70% between June and July. These numbers have triggered a large amount of publicity, generating a high ROI compared to the initial investment in helping Alan accomplish his travel. Today, the videos keep trending on social media; the more content on the Riviera Nayarit, the higher the viralization of the destination. Leaders such as Alan create these trends. Alan also published a note on his webpage, where he gave away souvenirs from the Riviera Nayarit to subscribers who answered a series of simple questions.